Hot and fresh from the oven, these Buttermilk Blueberry Scones will warm up even the chilliest of mornings. To really make these scones something to crave, serve with Betty’s Famous Lemon Curd. Makes 10-12 scones. Preheat oven to 400(F). In a bowl, combine flour, 1/3 cup sugar, baking powder, baking soda and salt. Stir together. Cut butter into pieces. Add butter pieces to dry mixture. 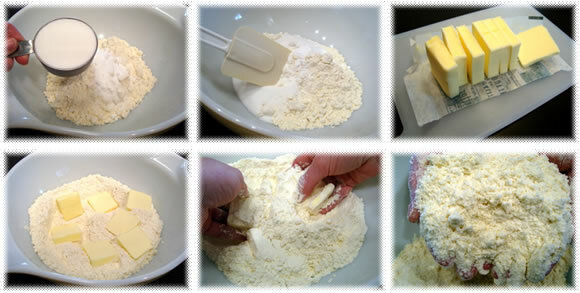 Using a pastry cutter or your fingers, incorporate butter pieces until mixture resembles coarse crumbs. In a separate bowl combine egg, 2/3 cup buttermilk and vanilla. Add blueberries to dry mixture. 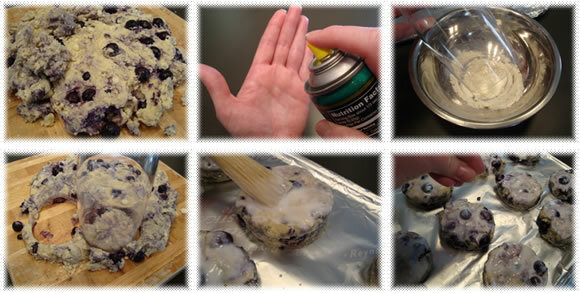 Carefully coat blueberries with dry mixture. This will also prevent blue “bleed.” Create a well in the center of mixture. Add buttermilk mixture all at once to the well. Carefully combine, just until moistened. Pour mixture onto board. TIP: Spray hands with cooking oil. This will keep the dough from sticking to your hands when patting out the dough. Tricky, huh? Flour edge of a biscuit cutter, pastry cutter or plain ol’ drinking glass. Cut into shapes and place on a baking sheet. Brush tops with buttermilk and sprinkle with sugar. Bake in a preheated 400(F) oven for 12-14 minutes until golden brown. Serve fresh from the oven with Betty’s Famous Lemon Curd. Makes 10 – 12 scones. Link to Big Dance Buttermilk Blueberry Scones blog post. Looking for more Breakfast and Brunch goodies? Can you say drool? These look soooo good Betty I”m definitely giving these a ty! Anything but Blueberry is what I like most. But this sounds so good, I’m gonna try it out. Average Bettys’ never steered me wrong before. Oh yum. Good idea to spray the hands with cooking spray. Don’t know why I’ve never thought of that. I just did strawberry scones the other day and the dough was sticking to my hands like mad! I’m going to try these this weekend ….for my guests at the inn. They look really good – I buy about 60 lbs. of blueberries in the summer and freeze them – then I have them to use all winter. I’ve found that the secret to good scones is either heavy cream or buttermilk….so I know these are going to be good! Oh my! All the love! *gushes* Thank you all so much! RecipeGirl- Necessity is the mother of all invention… or better yet, I remembered how my mother would always butter her hands before shaping dinner rolls! 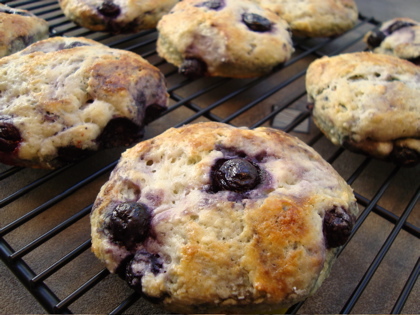 Wow, these blueberry scones look delicious! I can’t wait to try it out and I’m sure they will go well with my morning coffee. Did you use one stick of butter for this recipe? Thank you! I hope you do try them :) please take a pic and send it to me! Oh my gosh! That explains Liana’s question up there! Thanks for telling me the butter was omitted in the printed recipe. I fixed it up and it’s all better. Glad that 4 tablespoons of butter worked out for you :) that’s healthier than 6! I was a little disappointed with this recipe….I added some lemon zest and good thing I did or there would have been no real flavor at all…..won’t make this one again….on a 10 scale I rate it a 3. Sorry you didn’t enjoy the recipe, Kathleen… Everyone has different tastes I guess and this one wasn’t a fit for you. Hope you give some of my others a try. Thanks for dropping by and sharing your opinions. I just made these with some blueberries I picked in Maine. They were awesome. The pictures are very helpful and enticing. Thanks! I didn’t care for this recipe either. I, like Kathleen, found it to be bland and was disappointed with the texture. It was more like a muffin than a scone. Thumbs Down. Bakerrgirrl, sorry you didn’t dig my scones. Not all recipes are a perfect fit for everyone. I hope you do find a scone recipe you like somewhere on this big internet… Good luck! I am looking at this recipe and I am confused by the fact that your ingredients list calls for 6 tbsp of butter but in the written directions you say to use a stick of butter. A stick of butter is 8 tbsp…so which is it? I hope you answer quickly because I would really love to try these for an upcoming bake sale I am doing. Sorry for the confusion. My recipe calls for six tablespoons of butter. Although a gal from Colorado, at high elevation, used a whole stick (8 tbsp) and said that worked for her. I hope you enjoy the scones! HooBoy! 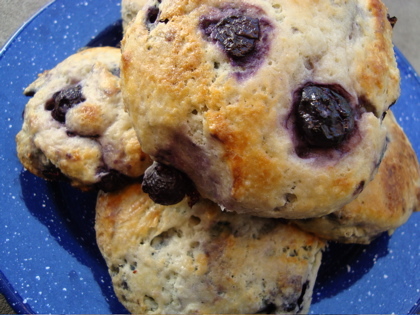 I had some frozen blueberries, buttermilk, and a scone craving…and stumbled upon this recipe. And oooo they are so tasty! I just finished munching on warm from the oven. And even though I was sadly out of vanilla, it all still worked out great. Thanks so much for putting this up, I’ll defiantly be making it again! Great recipe! My hubby LOVES these scones…I have a feeling you’ve just turned me into a baker! Hi! These came out great – although I’d recommend greasing the baking sheet! I had some issues with them sticking when I took them out of the oven – just wanted to pass that on! I like this scone a lot. Before I bump into this recipe, I have never tried scone made from buttermilk before… the scone is awesome. It is not just delicious and all the ingredients are accessible locally. Usually I would bake a fairly large batch to share with my family. 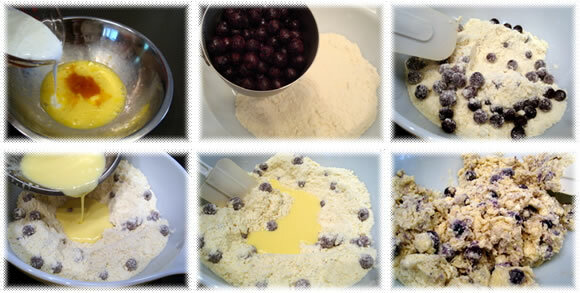 As of today I will have made your blueberry scone recipe 3 times and I LOVE IT!! My husband thinks they’re the best I’ve ever made. Thanks so much for the recipe. My next task will be to whip up some curd to go with them. Thank you!! made these for christmas breakfast for about 30 people. huge hit!! Very good but baking time was way off. I cut out 10 and it took 24-27 minutes for them to get golden brown. I just made these, and they are totally delicious. 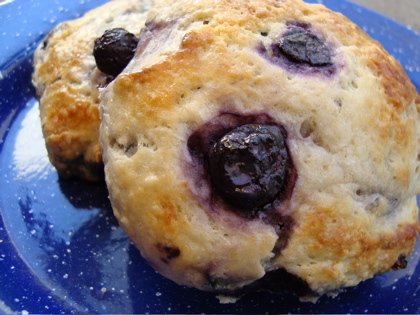 Moisture wasn’t a problem at all – I added some more blueberries so it was pretty much just blueberry deliciousness with some scone dough. They were very sticky to work with but it didn’t bother me. Thank you! Made these twice so far — no complaints from my culinary guinea pigs! First batch I used a heaping half-cup of fresh cranberries and a heaping half-cup of frozen blueberries. For today’s version (Happy Easter), I only had frozen blueberries, but I micro-planed some fresh ginger into the buttermilk/egg for a lovely back note. What drew me to your recipe was that the technique and ingredients are not so terribly different than my buttermilk biscuit recipe (pretty much the Southern Living version), so I felt pretty confident going in I would end up with something **edible**. Love these scones! Did use 1/2 cup sugar as have made before and desired slightly sweeter, added more blueberries and sprayed pan, left all together as running out of time, but spread in circle, scored dough and baked about 20 min. Starbucks can go back to bed! Just did my first scones in life and they look amazing. You will rock in my kitchen Betty in Montreal Canada !